Featuring a comfy pillow-top King Size bed and a desk with a chair, our Single King Room will make you feel right at home. 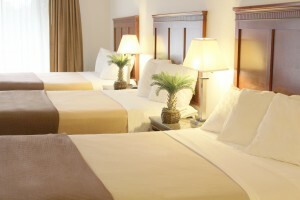 This air-conditioned non-smoking room is perfect for couples. As the top choice amongst Santa Clara Hotels, each room includes a refrigerator, microwave, coffee/tea maker and cable TV with HBO and ESPN channels. Guests can also enjoy free wireless internet and a work desk making this room perfect for corporate travelers. Perfect for a family or large group traveling together, the Triple Queen Room is a spacious and comfortable air-conditioned non smoking room featuring 3 plush pillow-top beds and a desk with a chair. This unique room can accommodate up to 6 adults making it a unique lodging option for groups traveling to Santa Clara. For your convenience, this room also includes a refrigerator, microwave, coffee/tea maker and a 25” TV with HBO and ESPN. The full private bathroom features a tub/shower combination, hairdryer and complimentary toiletries. 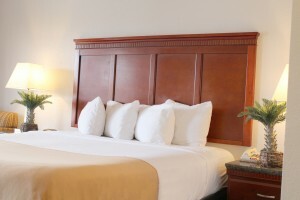 The Double Queen Accessible Room has been designed to comfortably accommodate up to four adults making it a perfect room for groups or families traveling to Santa Clara. Featuring two Queen Size pillow-top beds, a desk and chair, refrigerator and a microwave, guests can enjoy all of the comforts of home. 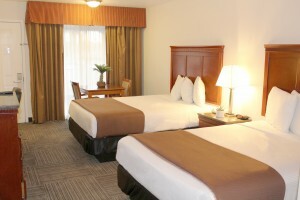 We invite you to relax in your room and watch a movie or sports game on a flatscreen TV with Cable, ESPN and HBO. Each bathroom features a private bathroom with hairdryer and complimentary toiletries.